A fast-paced, competitive card game in a sci-fi setting where seven mega-corporations have long since taken hold of humanity's future. Deeply embroiled in a not-so-friendly competition, these corporations are looking for everyone and any opportunity to gain an advantage. As representatives of these corporations, players must outwit, outbid, or outlive their opponents in a brutal game of on-the-fly strategy and corporate posturing. Victory can be achieved by gaining the most Prestige, or by outlasting your opponents. Zero Sum: The Card Game can be played as free-for-all or team-based competition with 1-6 players. As an agent of a mega-corporation, you are tasked with expanding your corporation's foothold across the galaxy. Entrusted with a generous number of funds, you are expected to build up a respectable presence on the remote, mineral-rich planet of Zatheon Alpha 3. As you achieve success you will be promoted up the ranks, gaining access to new abilities and funds. Despite the harsh challenges that face you, your corporate overlords will accept nothing less than perfect execution. Let's your benefactors, shall we? Wielding the galaxy's most powerful military, TechNet ruthlessly pursues its goal of advancing the human condition through synthetic augmentation and enhancement. They hold a position of unprecedented economic power through a monopoly on the coveted mineral Technetium. Dedicated to the digital preservation of humanity, Anacron controls the galaxy's information networks. Most of Anacron's citizens exist as digital entities, living consciousnesses called Wraiths that have been connected to the Uplink, Anacron's vast biosynthetic network. On the surface, Nishka Black is the face of the galaxy's correctional institutions. Beneath that lies a brutal hierarchy that encourages both the methodical sabotage by some of the most vicious business minds in the colonized universe and the wild fanatical fervor of the vast Nishka Black military. Each corporation has unique mechanics and assets. No corporation will play exactly the same, opening up opportunities for deep strategy and rewarding game mastery. Each player begins the game with a deck of thirty cards, a corporate Badge, five cards in their hand, and a total of forty Kredits in the bank. These Kredits are the lifeblood of your corporation - run out of them, and you’re eliminated from the game. Players will seek to earn a total of ten Prestige Points for their corporation by overcoming a variety of challenges that come in the form of Crisis Cards - a unique type of card that forms the backbone of Zero Sum: The Card Game's game play. Crisis cards represent the hostile environment of Zatheon Alpha 3. By overcoming the challenges presented by these cards, players can earn Prestige Points. If a player reaches a total of ten Prestige Points, they win the game. Every turn, players will reveal two or three Crisis Cards. The Crisis effect of each card will immediately punish all players. Any Crisis cards that are not dealt with by players will remain active on the board and continue to unleash their unpleasant Crisis effects on the next turn. 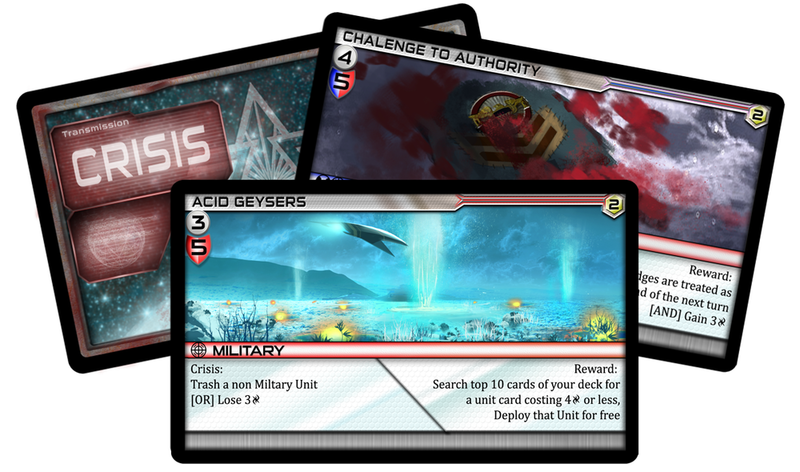 Players can directly engage with Crisis Cards by deploying Units from their hand, or attempt to sabotage other players through clever use of Covert Op, Asset, and Tactic cards. Once a player begins a Crisis engagement, other players have the opportunity to try and outbid that player and take the Crisis card for themselves. Each player begins the game wielding the badge of their chosen corporation. These Badges have abilities on them unique to each of the corporations that can fundamentally alter how players operate within the game. Once players gain five Prestige Points, they unlock their Corporate Agent. Each Agent has a passive and active ability that can be used every turn. Agents are extremely powerful, game-changing cards that provide key mechanics for players to consider when deck building. For more information about the game itself and what goes on behind-the-scenes, take a look at the Zero Sum development blog. Rule of Three was born on a remote, wind-swept island off all known shipping routes. He crafted a flying machine built of kelp, dolphin bones and fishing line to perform a daring assault on a passing pirate vessel. After he landed, he was taken prisoner, but convinced the crew to mutiny and band together under the Bad Captain standard. Amelia spent several years lost on a derelict vessel before joining the Bad Captain crew. Now, she devotes her time to scouting, bilge pumping, and deck swabbing, with occasional time off to chart the stars. Long feared as the ruthless leader of a band of corsairs, Sybaris Max crossed cutlasses with countless foes during her years as an independent sailor. After gaining control of a series of coastal islands known for their fine cuisine and rare wildlife, Sybaris Max offered to join Bad Captain in an unprecedented and profitable alliance.